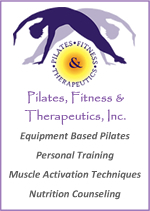 Welcome to “Fast Fit Tips” where you will find exercises from the studio that you may need to refresh your memory. You will also find tips for exercising while traveling away from Naples, fitness advice from Jennifer, inspiration, and fun facts and figures. Ballet stretches are one of my favorite exercise series to practice. When your body needs a good stretch, especially when your lower back starts to talk to you or your leg muscles feel tight, this series is perfect. Whether it be on the golf course, tennis court or at home, take a few minutes to implement these stretches and you will notice how much better you feel. Hamstring Stretch: Stand facing forward with your hips square and level, place one leg on a stool and bend forward from your hips. Reach as far as is comfortable for you. To increase the stretch you can pull your ankle so your toes as facing up. 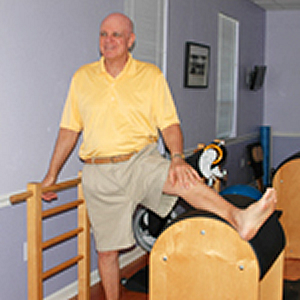 Quadriceps: Stand facing away while keeping your hips square and level, place one foot and ankle on a stool. Stand up straight while keeping your knee aligned directly underneath your hip. Slightly arch your back lifting from your chest up towards the ceiling. To increase the stretch, add a pelvic tilt or tuck your pelvis underneath you. Inner Thigh / Adductors: Stand facing sideways, making sure your pelvis is facing forward and is square. Place one leg on a stool at a 45 degree angle your leg forward of your hip then turn your leg away from you at the hip joint into external rotation. 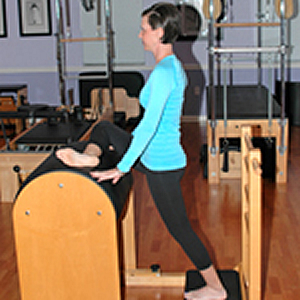 Side bend towards the stool to feel the stretch in your inner thigh. 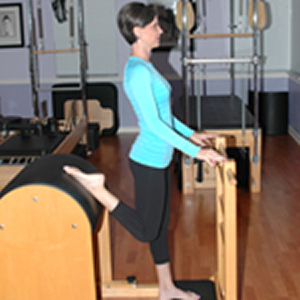 Glute / Hip Rotators: Stand facing forward making sure your hips are level and your pelvis is square. 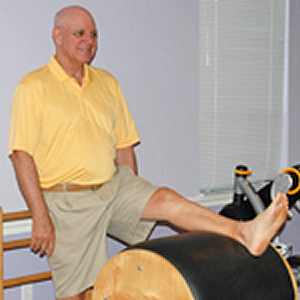 Keep the back foot flat on the floor while your opposite leg is on your stool at a 90 degree angle bent at your knee. Bend forward to feel the stretch in your hip and glute. I will also be adding some fun information such as kitchen and cooking tips, as well as nutrition facts and figures. So, for now explore and enjoy! To show the recipe, please click on one you are interested in. Toggle on (+). Toggle off (-). My breakfast smoothies are a fast way to get going on a busy morning. Just blend and you’re on your way. In your blender, place the fruit in first, add the chia seeds, powder of choice and ice. Add the liquid and blend until smooth. Enjoy! As a replacement for the protein powder, you may exchange yogurt for a creamy consistency. I also add peanut butter from time to time. In a medium saucepan, combine the apple juice and water. Bring to a simmer over medium heat. Rinse and drain the Quinoa in a fine mets strainer. Heat a medium sauté pan over medium heat; add the quinoa and toast it. Stir constantly until the grain begins popping, 2-3 minutes. Add the quinoa, dried fruits, and spices to the sauce pan. Simmer, stirring occasionally, until the quinoa is clear and soft, 12-15 minutes. Stir in the couscous. Remove pan from heat and cover. Let stand until the couscous has absorbed the liquid and is fluffy, 5-7 minutes. Stir in milk, if desired. This is an easy recipe that allows for a quick breakfast or snack. You get your protein and vegetables one quick bite. You can change the vegetables and protein so you always enjoy something new. I hope you enjoy them as much as I do. Spray the bottom of a muffin tin with pam. Place chopped vegetables in the bottom, layer in ham if desired. Cover with a small amount of shredded cheese and sprinkle with salt and pepper. Break an egg over the top of each hole or use egg whites only. Bake at 350 degrees for 20 minutes or until the yolk is to your liking. Let cool and refrigerate. 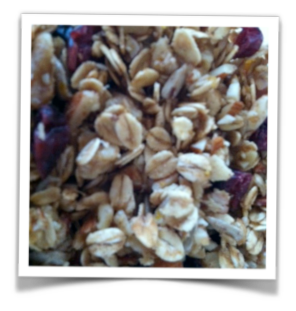 Healthy Berry Nutty Granola is a favorite staple in my kitchen. I make multiple batches at once and store it in my refrigerator. It is a recipe I found at the Berkley Heart Lab. Once I tried it, I was in love! Perfect for a morning cereal topped with fresh berries and skim or low fat milk. Enjoy it as a snack in between meals by itself or as a topper for yogurt. Pre-heat oven to 325 degrees. Combine honey, oil, vanilla, spices, and orange zest in a large mixing bowl. Stir in the almonds and walnuts. Set aside. Mix oats and sunflower seeds on a cookie sheet with sides. Shake the pan to even out the oats and seeds. Bake for 4 minutes, carefully shake the pan and bake for 4 more minutes. Remove pan from the oven and pour the oat and seed mixture into the honey mixture. Pour back onto the sheet pan. Use a spatula to spread the oats evenly. Return to the oven and bake 5 minutes. Stir the mixture, evening it out again and bake for 5-7 minutes longer, until the nuts and oats are golden brown. Remove the pan front he oven and place on a heat proof surface. Stir in the cranberries. Using a large spatula or rolling pin, firmly compact the oat mixture. Allow to cool on he pan. When cooled, break apart and store in an airtight container. Use it for a snack, or as your cereal, top your yogurt, the options are endless. Enjoy! Quinoa is a great grain, that is easy and quick to cook. It is so versatile and can be paired with protein, vegetables, or citrus. Your imagination can run wild, have fun with it. Cook the quinoa according to the package instructions, add the chopped tomatoes and onions. Toss with the red wine vinegar and parsley. Try with dried cranberries, toasted sliced almonds, lemon zest and juice from one half of a lemon. You can also use orange juice and zest in place of the lemon. If you are looking for a way to reduce carbs, lettuce wraps are the way to go. Perfect for lunch or a snack, this is also a great way to use leftovers and the options are endless. A couple of my favorites are listed here. Seared sea scallops make a great entrée because they have a delicious sweet flavor and cook very quickly. Just be sure to buy dry-pack scallops with no chemicals added so they sear well. Pat scallops dry w/ paper towels and season them with salt and pepper. In a 12 inch heavy skillet, heat oil over medium-high heat. Add scallops and cook until they are seared on both sides and slightly firm to the touch, about 2 minutes per side. Remove scallops from the pan and keep warm. In same skillet, reduce heat to medium, and add the butter and shallots, Cook, stirring frequently, until the shallots soften; about 1 minute. Add orange juice, zest, and wine, stirring constantly, and cook for another minute. Season to taste with salt and pepper. To serve, place scallops on a mound of steamed spinach and pour sauce over the scallops. This soup couldn’t be easier to make, it is packed full of nutrients while at the same time being satisfying. I personally add chicken for extra protein but is just as delicious all on its own. This is a recipe courtesy of the Conscious Cuisine cookbook from Cary Neff. Enjoy!! Heat a medium stockpot over medium high heat. Add the olive oil to lightly coat the bottom the pan. Add the onion, celery, carrot and garlic. Cook until the onion has softened, about 2 minutes. Stir in the corn, barley, herbs, bay leaf and stock. This is also where I add the chicken. Bring to a boil. Reduce heat and simmer until the barley is softened, 20-25 minutes. Remove the bay leaf. Mix in the beans and spinach and season with salt and pepper. Heat through and serve. Note…to toast the barley, place in a dry sauté pan over medium heat for 3-5 minutes until golden brown. Perfect for fall, this flavorful Butternut Squash soup is one of my personal favorites. It is easy to prepare, and stores well in the freezer. You can also substitute pumpkin or acorn squash for the butternut squash. The warmth reminds me of those crisp fall days up North and the color brings back childhood memories of playing in big piles of crunchy leaves. Enjoy! Heat a medium stockpot over medium-high heat. Add the olive oil to lightly coat the bottom of the pan. Add the squash, onion and celery. Cook until the onion has softened, about 2 minutes. Add the bay leaf and cook for 2 minutes. Add enough of the stock to cover the vegetables and bring to a boil. Reduce heat and simmer until the squash is very soft, 20-25 minutes. Stir in the fresh oregano, nutmeg, salt, and pepper. Remove the bay leaf. Carefully ladle the soup into a blender and process until smooth. Strain though a fine mesh strainer or a colander lined with cheesecloth to remove any squash pulp. Return the strained soup to a pan over low heat. Taste and adjust the seasoning with additional salt, pepper and nutmeg, if desired. Add a little stock or water to give the soup a creamy consistency if it seems thick. For special occasions, I like to place a dollop of creme fraiche and chives on top. 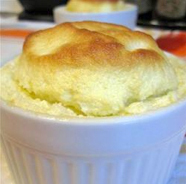 This is an easy recipe for quick lemon soufflés that never fail. Lemon curd is topped with a lemony soufflé and baked to a light dessert. The added flavor of the raspberry Coulis takes this dessert to a whole new level. Whisk the egg in a medium saucepan, and mix in the 1 lemon’s zest and juice, 1/4 cup sugar and cornstarch. Set over medium heat, and cook stirring constantly until the mixture thickens. Reduce heat to low, and continue whisking for another minute. Remove from the heat and stir in the butter. Divide between four 6 or 8 ounce ramekins. Set aside. In a medium glass or metal bowl, whip egg whites with an electric mixer. When they are able to hold a soft peak, sprinkle in 1 tablespoon of the sugar, and continue mixing until stiff. Whisk the remaining 4 tablespoons of sugar into the egg yolks along with the zest and juice of the remaining lemon. Fold a couple of spoonfuls of the egg whites into the yolks to lighten them up, then fold in the rest of the whites. Spoon into the ramekins over the lemon curd, and run a finger around the inside of each rim. Place the ramekins onto a baking sheet, and place in the preheated oven. Bake for 15 to 17 minutes, until puffed and golden brown. Let cool for about 5 minutes before serving. Serves 4. Combine sugar, berries, and 1/2 cup water in a saucepan; bring to a boil over medium-high heat. Reduce heat to medium low; cook until sugar is dissolved, about 8 minutes. Use a pastry brush dipped in water to brush down any sugar crystals on the side of the pan. Remove from heat; cool completely. Place mixture in the jar of a blender; puree until smooth. Pass through a fine-mesh colander, and discard solids. Position 1 rack in bottom third and 1 rack in top third of oven; preheat to 375°F. Line 2 large baking sheets with parchment paper. Blend first 4 ingredients in processor 30 seconds. Add eggs; process to blend. Add next 4 ingredients. Using on/off turns, process until oats are coarsely chopped and mixture is blended. Transfer to large bowl. Mix in cherries and chocolate chips. Spoon batter by rounded tablespoonfuls onto prepared baking sheets, spacing 2 inches apart (cookies will spread). Bake until tops of cookies are golden brown, rotating baking sheets after 7 minutes, about 14 minutes total. Transfer cookies to rack; let cool. Repeat with remaining batter.